The amur cork tree is native to parts of Asia - Korea, Japan and China - and has strong medicinal properties. It's a fairly sizable tree and is often left alone due to its gorgeous, tall expanse, aromatic leaves and beautiful fruit. Thankfully though, there are plenty in the region and only a portion of them have to be used to procure this oil. The deciduous trees - with dark leaves and brown, deep corkish bark - can grow to be nearly 12 meters tall. The interesting part about this tree and its benefits is that most trees aren't used for their bark until after they've reached 10 years old, while the fruit can be used right away. Also, the process of collection is typically in the winter. Here are some of the key benefits of amur cork tree oil. Due to the properties within the oil, it's a great way to reduce fevers. When you become sick, it can feel like there's no end in sight and that you're just going to be miserable forever - night sweats, coughs, body aches. The flu is never a fun endeavor. Even sleeping can seem like something difficult to do. Using a bit of amur cork tree oil can help get rid of that fever. Apply it to your pressure points on your wrist and on the bottoms of your feet. The fever will get drawn out and you'll start to feel better in eight to 12 hours. This is a potent oil and only should be ingested in very small quantities. It seems that when the oil is used internally, it has many beneficial effects on the system. It has been known to help regulate and normalize blood sugar levels. One of the most dangerous and pervasive diseases is diabetes and when blood sugar levels get out of control it can become a really dangerous situation. Just a small amount of amur cork tree oil helps to stabilize erratic blood sugar levels. The fruit that comes from the amur cork tree is a natural expectorant, which means that it helps to rid the body of all the things that build up inside as a result. The congestion and the excess fluid are easily diminished in the presence of this oil. Are you suffering from a terrible cough that seems to just hang on for weeks at a time? 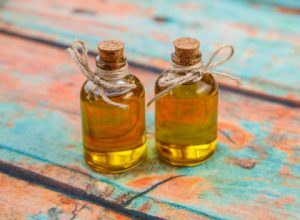 Try putting some of this oil directly on your chest to loosen up the congestion and phlegm. It will help to make breathing easier and help loosen your pathways obstructed in your lungs. If you are suffering with this skin condition, you likely have tried a myriad of other options. Some may not work at all while others may work short-term. The fruit that comes from the amur cork tree has nutrient-rich properties that not only help to clear up signs of eczema but also nourishes the skin while it's being healed. Eczema is deeply tied to an autoimmune condition and the management of your skin is crucial.